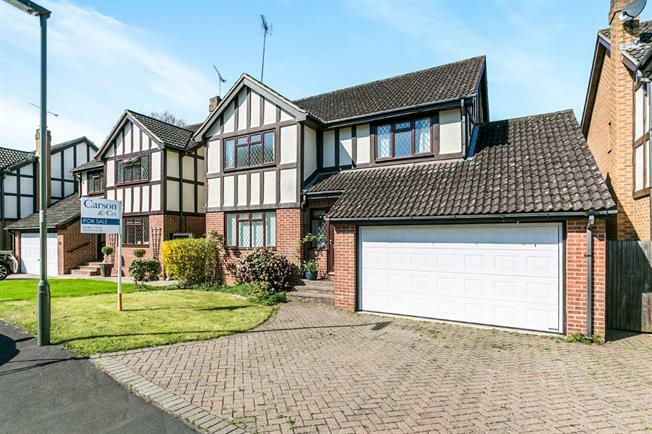 4 Bedroom Detached House For Sale in Woking for Guide Price £650,000. Situated within a quiet cul-de-sac and opposite woodland, this family home offers spacious and flexible living space. Downstairs, there is a large hallway which leads to the lounge with fireplace and access through to the dining room. The dining room has French doors leading out to an 18' wooden framed conservatory. The kitchen and utility area has been knocked through to make one large kitchen with induction hob and Belfast sink. There is a down stairs cloak room and separate study or family room. Upstairs the property has four double bedrooms a spacious family bathroom and en-suite from the master bedroom. The property has a large decking area. There is access to the double garage from the side of the property and side access into the garden.